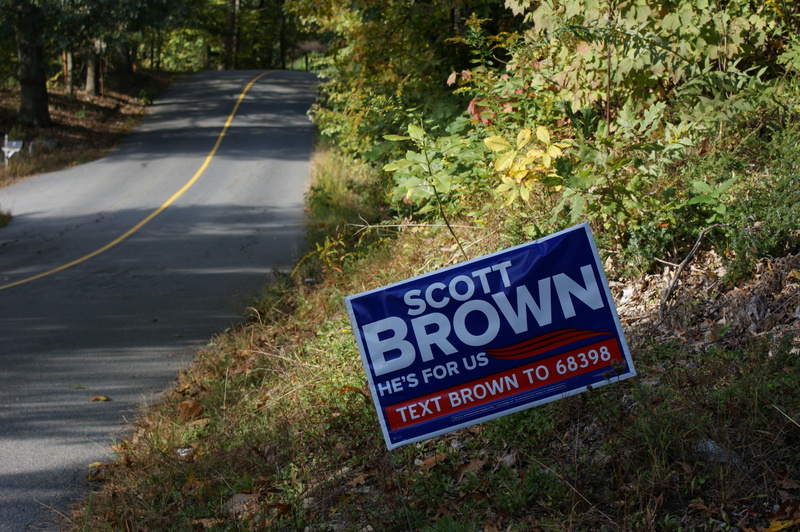 Texting While Driving is Illegal In Massachusetts, Senator Brown. So What’s With the Signs? 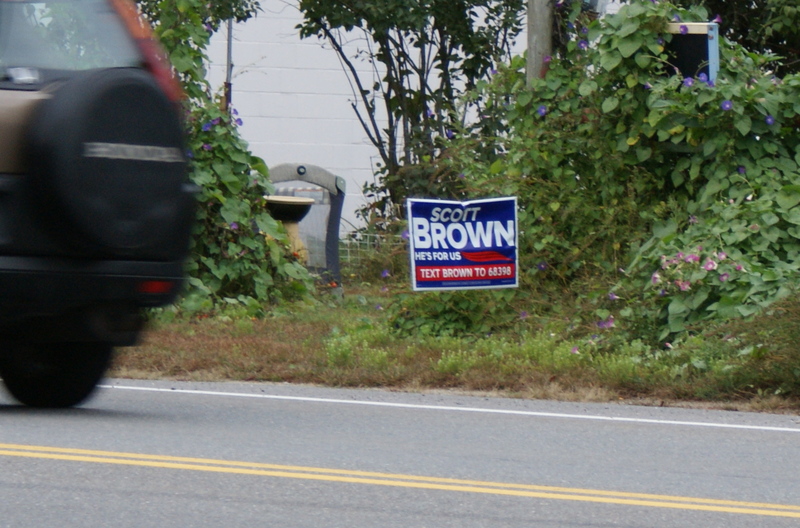 So even if you’re stopped at an intersection near a campaign sign and have this incredible urge to communicate your undying loyalty to Senator Brown, you are still breaking the law. And what happens if you do text him? Is it an automatic contribution if you do, like giving to relief efforts in Haiti? Permission to solicit contributions from you using your cell phone number? Maybe he wants to text you back (uh-oh) a pic of him in his barn jacket, or more appropriately in his pickup truck, or to assure he understands women’s issues because he is – gasp – married to one. (I’m married to a lovely man; still, I make no claims about understanding anything about men.) I doubt he wants to send you his voting record. Oh, but now I sound partisan. I was raised a Republican, but it meant something different then. Actually, after Brown won against Martha Coakley (which is an entirely different post) I was willing to give him the benefit of the doubt, but then I watched him for a couple of years and last summer Elizabeth Warren stepped into the race, presenting us with the opportunity to break the glass ceiling in not-as-liberal-as-the-rest-of-America-thinks Massachusetts. A law professor who understands the banking system who also happens to be female – she’s certainly worth considering. I don’t want her to blindly vote the party line any more that I did Brown; I hope she understands that. And if she had put up signs like these I’d have taken her to task, too. 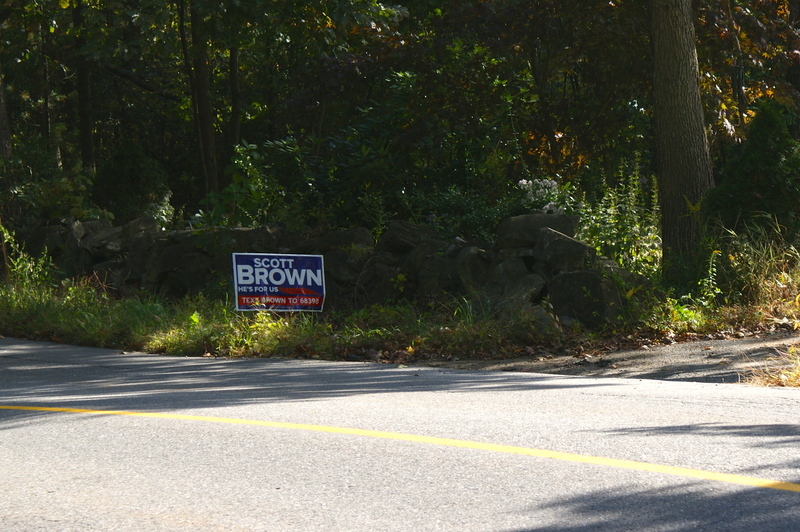 But really, anyone who plasters Massachusetts byways with signs that prompt people to break the law – on his behalf, no less – might not want to be the one making laws in Congress. Just a thought. Oh, and – hmm – WBUR is having an irksome pledge drive this week. What do you think would happen if NPR had a pledge drive that you could contribute to via text? I’m pretty sure someone would have Nina Totenberg up on charges in no time. It’s all about connecting the dots . . .